Posted on 18, March 2016 by EuropaWire PR Editors | This entry was posted in Internet & Online, Media, Norway, Switzerland and tagged EBU.ch, Eurovision, Jean Philip De Tender, Social Media Trends Summit 2016. Bookmark the permalink. Le Grand-Saconnex, Switzerland, 18-Mar-2016 — /EuropaWire/ — Presentations from this year’s Social Media Trends Summit are now available on EBU.ch. The event brought together around 100 experts from EBU broadcasters and big social brands. The event hashtag #EBUsocial – where you can find lots of related content – trended on Twitter with over 375,000 impressions throughout the 2-day conference. EBU Members met to discuss public service in the age of social media. In his introductory video, EBU Media Director Jean Philip De Tender mentioned that this year brought our broadcasters together not just to discuss social platforms, but to “talk about media becoming social”. He noted that becoming social “is crucial to public service media, as with every big brand. This is what allows us to truly connect with our audiences”. Members shared sophisticated programme marketing and youth targeting strategies, particularly using platforms like SnapChat and Instagram. 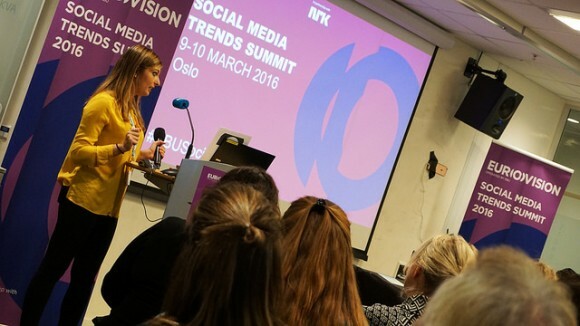 Case studies from BBC’s Newsnight, NRK’s Digital Spearheads and Innafor, SVT Lilla Aktuell, VRT’s Creative Lab and ZDF’s Heuteplus clearly showed progress in adopting more refined storytelling aimed specifically at social media users. A number of keynote speakers from Twitter, Google and the ‘influencer marketing agency’ Social Chain provided a private-sector look at engagement and campaign strategies. Twitter’s Director of Broadcast Partnerships Dan Biddle opened the second day with a talk on the power of live engagement, citing the Eurovision Song Contest as one of the most powerful examples. 23-year-old Steve Bartlett from Social Chain impressed the crowd with the claim that his agency could get anything trending on Twitter within 30 minutes. He also showcased several of their recent viral campaigns, like the creation of the pretend football star Rex Secco for SoccerEx and their golden envelope Snapchat treasure hunt. Intellectual Property Lawyer Adam Rendle, a Senior Associate at Taylor Wessing, gave an eye-opening talk on social media copyright and cost of getting it wrong. While Google News Labs Manager Matt Cooke walked through new tools available to journalists to enable engaging data journalism, and never.no’s Ed Albis presented their social TV platform STORY designed for integrating social elements for live on air events. Highlights and more detailed meeting notes can be found on this Storify page. Presentations are available on the Social Media Trends Summit events page. This year’s event was hosted by Norwegian broadcaster NRK in Oslo.